Service Dog In Training and Handler Detained by Southwest Airlines. A Southwest Airlines employee said he was sick and tired of people with their “fake service dogs” getting a free ride on the airlines, and decided to take matters into his own hands. But, he may have taken out his frustrations on the wrong person, dog and organization. Richard Starks, a trainer with Florida’s K9s for Warriors, was all set to travel from San Jose, California to Tampa, Florida with Stew, a service dog in training on Saturday, August 31. Starks was transporting the 112-pound Bull Mastiff, scheduled to be assigned as a service dog to retired Staff Sgt., Alonzo Lunsford, a survivor of the 2009 Fort Hood mass shooting. Starks and Stew had been cleared for boarding by Southwest Airlines Customer Service. They made it through security. But just moments before setting foot on the plane, Starks was detained by a Southwest Airlines supervisor who began loudly interrogating him, even stating, “You look fine to me…” Even after Starks presented the proper paperwork including Stew’s service dog ID, the employee would not allow the pair to board the plane. He insisted that Starks publicly disclose the details of his own disability before being allowed on the plane. The Americans with Disabilities Act (ADA) clearly states that a service dog is permitted access to public places, including restaurants, hotels, theaters and taxicabs. A provision in the law designed to protect the privacy of people with disabilities and to prevent discrimination clearly states that the individual does not have to prove his or her disability. In fact, only two questions are permitted to be asked: 1) Is your dog a service dog? 2) What tasks has the dog been trained to perform? Businesses cannot require special identification for the dog or ask about the person’s disability. It does not matter whether the dog is wearing a service-dog vest or whether the owner’s disability is visible. These provisions have been approved by the Department of Justice. But, the service-dog issue is posing some special problems for airlines, due partly to people traveling with dogs wearing jackets indicating that they are service dogs when they are not. The jackets are simply purchased over the internet, no questions asked. Employees, confused over the definition between a service dog and a therapy dog, are often not well-versed enough in the law and/or trained to act accordingly. To make matters more confusing, other laws supersede the ADA when it comes to air travel and housing. 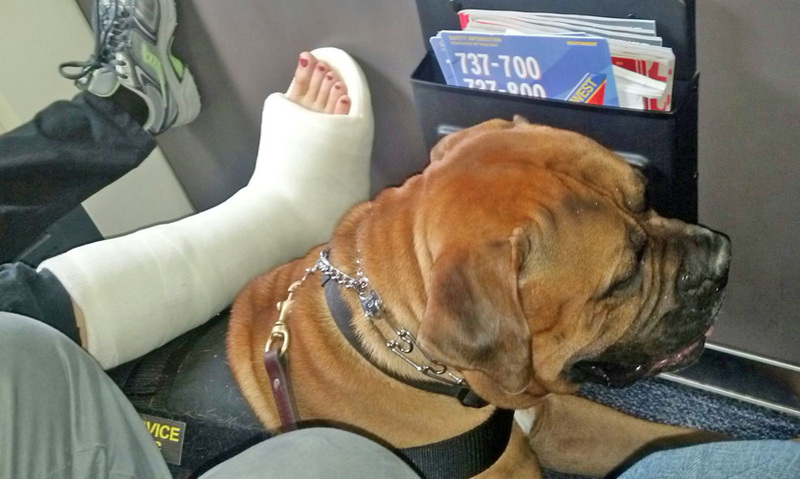 Unlike the ADA, the Air Carrier Access Act allows airlines to require passengers with emotional support and psychiatric service dogs to prove they are disabled and that their dog is trained to assist them. This is done via the requirement of a letter on the letterhead of a licensed psychiatrist, psychologist or clinical social worker stating that the passenger has a medically recognized mental or emotional disability and is under the professional’s care. The letter must be dated within one year of the flight. And, here is the rub, Southwest Airlines: it’s estimated that 13 to 20 percent of the more than 2.6 million Americans who served in Iraq or Afghanistan since 2001, have or could develop Post Traumatic Stress Disease (formerly known as Post Traumatic Stress Disorder). Every 80 minutes, a veteran commits suicide, which means the total number of deaths by suicide is more than 6500 veterans every year. That is more than the total number of soldiers killed in Afghanistan and Iraq to date. Dogs, whose sole function is to provide comfort or emotional support, do not qualify as service animals under the ADA. However, according to the ADA, dogs that calm a person with PTSD during an anxiety attack are considered a “reasonable modification to ADA policies.” We would hope those policies include a person’s right to privacy and protection from discrimination. Once the Southwest Airlines employee was satisfied with Starks’ answer, he allowed the pair to board the plane. Other passengers came up to Starks and apologized for the disgraceful conduct displayed by the Southwest Airlines employee. By the time Starks and Stew reached their layover in Phoenix, Southwest Airlines staff were on hand to greet them and ensure the rest of their trip was incident-free. But Starks admits that he was adversely-affected by the incident. He was, understandably, angry and upset and is currently contemplating his next step. Finally on the plane, Stew provided relief to a fellow passenger. Photo provided by Richard Starks. But, why aren’t the airlines lobbying Congress to correct these problems and clarify the laws, provisions and rules? It’s a question Shari Duval, Executive Director for K9s for Warriors is asking, and one that she will surely find an answer to as she plans to go before Congress herself. “Southwest Airlines could be the leader in righting these wrongs,” Shari told The New Barker dog magazine. “They could be an advocate for educating the public and industries that service the public on the ADA provisions, as supported by the United States Department of Justice,” she added. “Veterans who go through three weeks of training with their service dogs here at K9s for Warriors, deserve better treatment than this. And, believe me, I will fight for them,” said Shari. About K9s for Warriors: A non-profit organization that provides and trains service dogs for veterans with PTSD. Ninety-five percent of the dogs come from rescue shelters. The office and training facility are located in Ponte Vedra Beach, Florida. The veteran is given a service canine, complete training, certification and housing during their training. There is no charge to the veteran for the service that K9s for Warriors provides. The Department of Veterans Affairs will not cover the cost of dogs assigned for mental disabilities like PTSD, according to new federal regulations. They will pay for service dogs assigned to veterans with impaired vision, hearing or mobility. Therefore K9s for Warriors relies on community support, donations and fundraising efforts. To learn more about this organization, please visit http://www.k9sforwarriors.org. 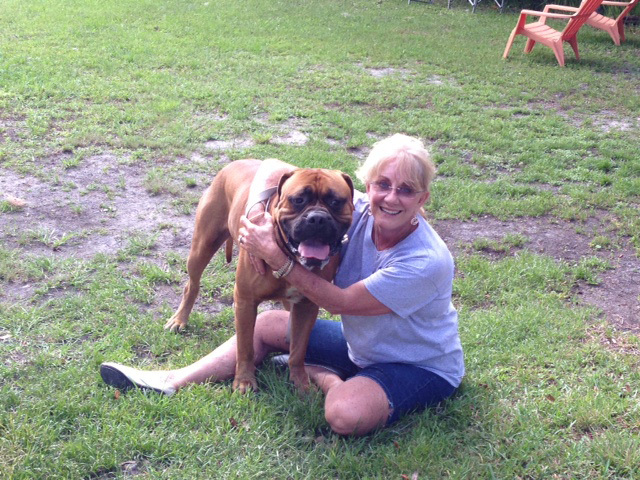 Stew, safe and sound in Ponte Vedra, Florida with K9s for Warriors executive director, Shari Duval. I would like to make a comment regarding Southwest Airlines. SWA has provided a local service dog organization in Phoenix, Arizona, on a number of occasions, access to one of its planes in the hanger. That gives us the opportunity to see how well the dogs in training do while trying to lay in cramped spots for long periods time. We test the dogs with all kinds of distractions during this training. Also, it was before my time, but I understand that Southwest did a free flight for 10 of past service dogs in training. So I just want to say “Thank You” to SWA for its help! Southwest airlines is my airline of choice as I have never had an issue with them. Understand two things a service dog is not protected under ada or aca unless performing as a service dog with its handler. Second Southwest site specifically says it does not fly in training dogs. That is at their discretion. He was not a service dog until with his handler. It is your responsibility as a handler/trainer to know the guidelines. I fly frequently and I always call to speak with customer service to ensure no problems. They have been more than accommodating. In one instance my husband needed to return from Baltimore with my dog as we had kids to care for and I was hospitalized and would be for a week. The dog could not stay. We contacted southwest, they notated it in their system and he flew home and back to Baltimore to get me with no problem. Complain all you want but part of having a service dog is forethought and planning. Good communication prevents 98% of problems. I think his handling of the situation was wrong but he was within legal bounds like it or not. Thanks for your comment, Service Dog Girl. I agree with you on the forethought and planning. More Bias: That photo can’t be from this incident. They said he was last to board, crammed in a seat and dog had to fly with his paws up on Richard the whole way. They are sitting in the bulkhead in this photo. And the dog is wearing a vest which he didn’t have on for the flight in question. Propoganda at its finest. One more comment: If the trainer/handler truly felt his rights were being violated, he would have asked for a Complaint Resolution Officer (CRO) on the spot and filed a report right then and there. Instead it’s brought to Social Media where allegations cannot be verified/disputed. m strait, how ignorant of you to determine that all handlers and trainers would know to file a CRO. As a puppy raiser/ trainer for guide dogs of visally impaired people, I had no idea of this “CRO”, and you have no idea how much discrimination is out there on a daily basis, even with visually un-impaired trainers, let alone the blind person. One more comment, if you think that allegations of this situation can’t be verified or disputed, think again, because this was done in public with many witnesses around. Quit being so ignorant and open your eyes, as even the blind have more vison in life than you do. It’s a shame that it takes “Social Media” to right a wrong with people like yourself who simply don’t have the decency to be objective, and realize that there are good people in this world. Yes, this service animal, a bull mastif, is having to sit in bulkhead, a sacrifice he is willing to make without complaint, with or without a vest. He isn’t required by law to wear a vest, just as it isn’t required by law for you to wear a sign that says you are ignorant. This service dog is serving for a serviceman who served our country, to protect him from people like you and situations that make his life unbearable. Shame on you. My point was that anyone who is a trainer/handler for an organization such as K9s *should be aware of all disability rights and regulations. Especially since it has been inferred that the trainer himself has a disability. Trust me, when you are disabled, you KNOW all your rights and the recourse to take if they are violated. Also the bulkhead is a *desired seat because of the extra legroom/floor space. I will not insult you as have done me. I am merely stating facts and justifiably questioning exactly how the situation played out. People due tend to spin and exaggerate to make a point. yeah, the plane is boarding so they should have held up the planes departure costing the airline 10’s of thousands of dollars to wait while he fills out his complaint form, really? there is such a thing as moving on, no real harm done. September is National Guide Dog Month….I hope the airlines will look into this situation. A dog in “training” should be covered under ADA as it is preparing to become an “Offical Guide Dog.” Even out of courtesy and customer service Southwest could have handled this much better. Shame on that flight attendant for being so rude. Sad a few wreck it for everyone else…Folks can order vest for their dogs on line; it’s almost like the Blue Handi cap parking signs that sadly get abused. Sounds like the Southwest employee crossed the line. Obviously there could have been a better way to handle this. so many. Thank you for sharing this and hopefully this will not happen in the future. I don’t see why any dog can’t be in the cabin with you especially if you purchase a ticket for there seat and even have them ware a muzzle and a diaper just in case. Well behaved dogs a not an issue. i have always been treated with great respect on Delta. I call ahead & let them know im flying with a service dog & Ive NEVER had an issue. Every state has its own laws as well as the federal . ADA laws. They are usually the same. I am sorry you were given so much grief, just never tell them the dog is in training. Nip that in the bud. As long as the dog is behaving & trained as a service dog, just let it do its job. They did correct their wrong, but I know its very frustrating to have to go thru this. PLEASE!!! Our hero wounded warriors should be recognizable when boarding a plane. If they have a dog with them – the dog should be easily recognized also. Let’s help the airlines get up to speed on our heroes and their dogs who may travel on their airline. I support all kind is service best friends. I would suggest that a couple that posted, first are not qualified to even rattle there mouth, Which is also a disgrace to those in need of a Service Dog. Actually a SD in training could also be one that is being transported to see if the dog and person needing such are a good fit. So know what you are talking about or plainly shut up, as you are not help this Great Cause. Dogs “in training” don’t usually have public access nor do they need them. I can understand the confusion. This dog was NOT a service animal. If we accept your point of view, Elizabeth, then how are service dogs to be trained to help their owner in public and during flights if they are not allowed? Dogs in training need to be allowed just as those who are placed with and working with their owner must be allowed. The ADA language is aimed at protecting people who need service dogs and assumes that common sense will be used. People have no right legally or morally to question a person about a disability and the need for a service dog–in training or not. Dogs “in training” absolutely have and need to have public access. This is the whole point of a service dog, to be able to help a person in publicly accessed business and buildings. Many people, particularly people suffering with PTSD, can’t even leave their homes without the comfort and support of their service dog. How could they be trained on how to properly behave in public if they are not trained in public. The person training the dogs also has to go through specific training to take a service dog into public. They have to make sure that they can control the dog and keep the public and dog safe in the environment. It is imperative that FAA issue guidelines to ALL Airlines that service dogs be permitted on all airplanes. It is NOT up to airline employees to determine whether dogs are appropriate or not. I am appalled at SW Airlines’ employee’s conduct and have put this airline on my own personal “do not fly” list. The very first issue I see here is that the dog being transported is IN TRAINING. The dog is not IN SERVICE to anyone at this point. The remainder of the discussion of ADA and rights does not even seem to come into play after this point. Many airlines allow our dogs in training to fly and they make very welcome accommodations for us. SWA does not allow dogs in training, and like it or not, that is their prerogative. I do not give SWA my business for this very reason. Delta, US Airways, United all make us very welcome and they get my business. Surely there is some way to check the legitimacy of someone’s service dog that doesn’t include stressing someone who may already be suffering from an anxiety disorder??? Yes there are… It’s called ADA act which means they can only ask these two questions by Federal and State Laws. Unfortunately or fortunately state laws vary. In AZ, you may not ask anything if a customer comes into your store with an animal. We had one such gentleman come in with a dog, who was clearly terrified, who “claimed” it was his service dog. We asked him to leave as there were children in the store. He had no ID nor was the animal wearing any kind of identification. We are waiting for the lawsuit!! I have panic attacks along with being very claustrophobic. I do have a Doctors note to this affect. My canine happens to be a 3 pound Chihuahua that travels in a case that fits on my lap so that I can hold her, talk to her and pet her to keep my mind busy. American airline made me keep her under my seat while I flew from Chicago to Tampa. When that plane opened the door I was the first one out and I made it out of the tunnel in record time. I also have COPD and was having problems breathing. Believe me when I say that having a dog…no matter the breed..can be a great help. I am also deaf in one ear and the canine will bark to let me know I am being approached. I am also a balance problem and if I should fall the canine will bark. My dog is very friendly and will not bite. So I do not see a problem having her with me. I do not carry my purse. All I have is the case that fits on on lap. Previous Previous post: A Case for the Power of Love. Next Next post: September 11, 2001. Just Like Any Other Day for these Working Dog Heroes.